Recently, I was asked to name three books that had a big influence on me. I couldn’t remember the title of one of them at the time but, luckily, my Mum came to the rescue and found this copy second hand, bound inside a volume with 2 other books. 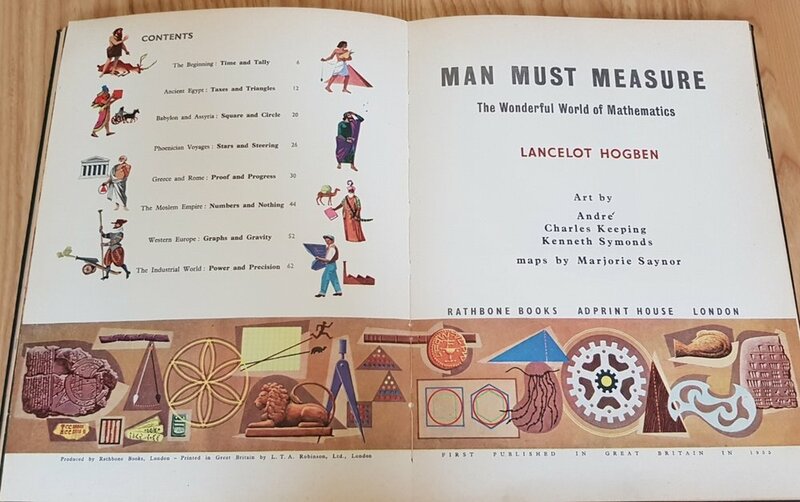 It’s called Man Must Measure – The Wonderful World of Mathematics by Lancelot Hogben, better known for Mathematics for the Million, and was published in 1955 by Rathbone Books. 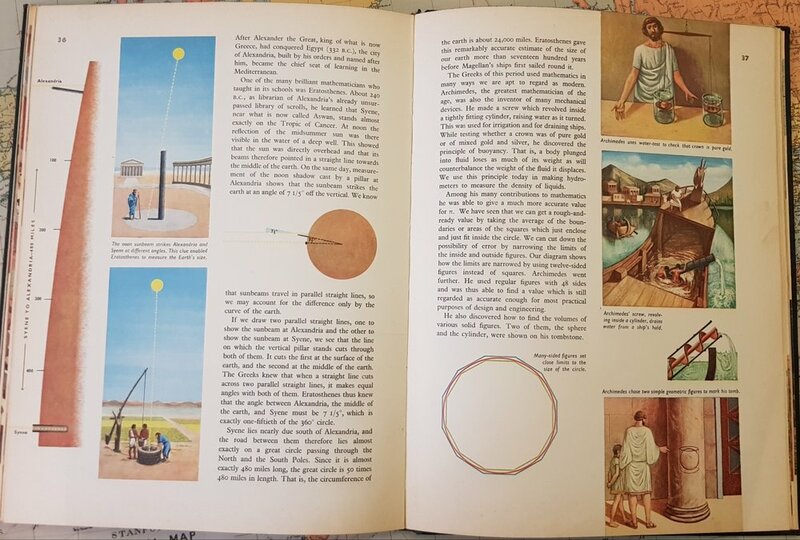 I credit this book not only with helping me understand the maths I was learning at school but also with kindling a fascination for how ancient civilisations were able to learn and discover and invent as much as they did without the libraries and schools and technology that I took for granted as a child. It made me see those people as so much more than the creators of the myths and legends that I already loved reading about. The story moves through history and begins with earliest man and woman’s need to use the stars as a map and making marks to record the passing of time so they could forage and hunt and, in time, farm and trade. It then travels through ancient Egypt, Bablyon and Assyria and so on until it reaches ‘The Industrial World’. I can’t believe that today’s children wouldn’t love this book too, certainly mine do. Maths plays the main character in the story of how man has learnt to understand the world and create many of the things that we take for granted today. For example, Hogben asks how the Egyptians were able to make the base of a pyramid an accurate square, vital to creating the shape of the whole building. He shows one way to make a right angle on the ground using pegs and string to make arcs, using a plumb line to make right angles in the air and how they made set squares by working out how to create a right angled triangle. It’s a very clever and fun way of teaching maths using history and problem solving and clearly illustrates why an understanding of these, sometimes dry, maths rules are so important. If you know children who love maths or, perhaps especially, if you know children who hate maths this could be the book that fires their imagination. Keep a look out for any second hand copies you can find. The Encyclopaedia Britannica online describes Lancelot Hogben as a zoologist, geneticist, medical statistician, and linguist, known especially for his many contributions to the study of social biology. He was more than that, jailed as a conscientious objector during WWI he was a staunch critic of eugenics and wrote of his ‘resistance to the racist policies of (pre-Apartheid) South Africa. If anyone knows of good biography of Hogben, I’d like to read it!